Basseterre, St. Kitts, May 25, 2018 (SKNIS): History is constantly being rewritten and must no longer be seen as a static piece of information, not only because new information is showing up, but there are also different points of view. 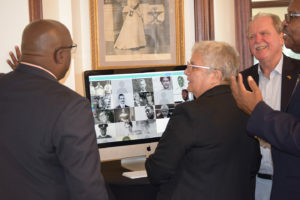 For this reason it was imperative that a new website be created for the St. Kitts and Nevis National Archives, says its director, Victoria O’Flaherty. Speaking at the launching ceremony at Government House, on May 25, Mrs. O’Flaherty said that it was time to make information gathered by the National Archives available to the public and to schools. Now there is “Historic St. Kitts,” said Mrs. O’Flaherty. She said that there are still gaps in the stories, but it is hoped that those gaps will be eventually filled. Mrs. O’Flaherty said that stories were found about organizations which were designed to help the worker who had little to fall back on. Also found were customs that are still part of our everyday life. She added that wherever possible visuals and audio were attached to the stories to give them an added dimension. The director made special mention of the St. Kitts and Nevis Information Service (SKNIS), which has helped in bringing the website to life. Mrs. O’Flaherty said that it is hoped that the information already on the website “will encourage a sense of belonging and pride, that it will encourage further explorations and that our stories will be confidently shared with our visitors.